Donald Trump has won Arizona's presidential contest and its 11 electoral votes. The Republican president-elect had a solid lead over Hillary Clinton on election night, but a winner wasn't declared because there were so many uncounted votes. The latest batch of returns tabulated Thursday made him the clear winner. It extends a 20-year winning streak for Republican presidential candidates in Arizona. Bill Clinton was the last Democrat to take the state, winning in 1996. Hillary Clinton was closer to gaining Arizona than Barack Obama, who lost by more than 9 percentage points during his two runs for president. She is losing by 4 points. Arizona was one of three races that had yet to be determined from the Tuesday election. 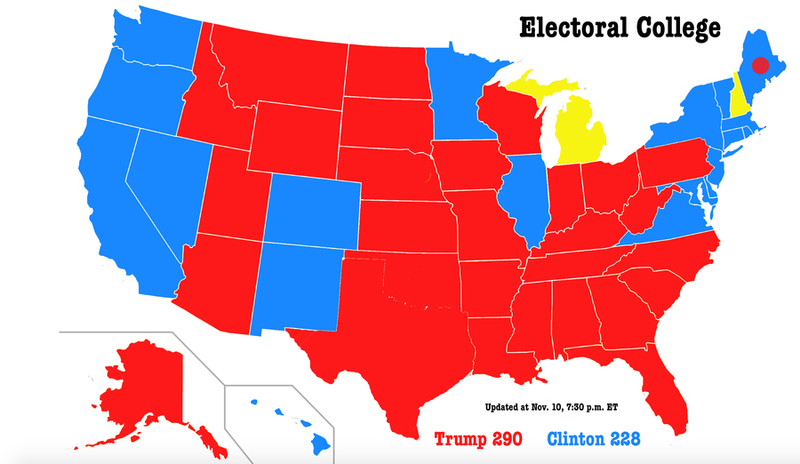 Michigan and New Hampshire remain too close to call.